← IS KIMI KICKING FERRARI INTO SHAPE? And I thought this GP would be a nice return to writing after I couldnt be bothered with the Malaysian GP. Kimi was 2nd and 3rd in all practice sessions in Malaysia. Then the rains came in qualifying and suddenly his car was not working as well as before. The race was over anyway on the first lap when Magnussen decided to hit the rear of Kimis car. Damaging his floor and puncturing his tire in the progress. Race over as he was sent to the back of the pack. Day ruined. Not a proud moment for the Dane. Or me. But that was then. Bahrain looked set to be a lot better. Kimi got the parts he demanded from Ferrari flown in. This to aid him in getting the car the way he prefers it. The practice sessions didnt give much hope that Ferrari had acheived that as he was way down the order. But whaddayaknow. Come qualifying and he puts in a good lap in Q3 and goes 6th. Not better than last weekend but higher than was expected contrary to Malaysia. Kimi gets a horrible start. Its not too bad off the line but he gets stuck behind a Williams. There’s a big space in the middle of the track which he has plenty of time to occupy but doesn’t and Alonso snatches that space instead. That sends him back amongst the pack. And whaddayaknow. In the sights of Magnussen once again. Believe it or not. He gives Kimi another hard smack on the rear of his Ferrari, making the back step out briefly. Thankfully no damage but WTF Magnussen!!?? Giddy-up little horsey. Force Indias are pulling away. Its hard to watch as Kimi gets passed by faster cars all through the race. Red Bulls that we were laughing about in pre-season testing. Force Indias. Williams cars. He tries to go longer on one set of soft tires, clearly going for a 2 stopper just to try something. 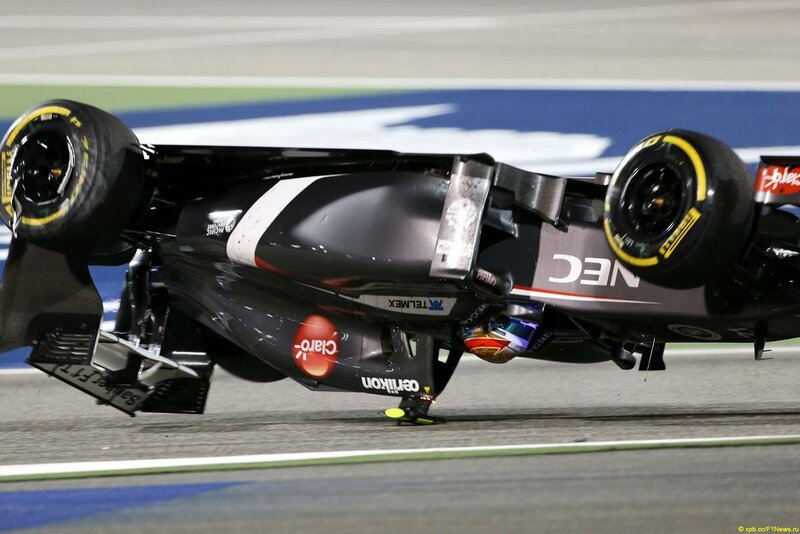 But stays out for too long and loses several seconds on one lap spiralling him even further down the order. At least there is a shot of making up a few places after he has made his stop for the harder tire. But then Maldonadon’t happens. He decides to torpedo Gutierrez in turn 1, flipping him completely over. It looked pretty scary and Esteban was visibly shaken afterwards. This brings out the safety car for only the second time in the history of the Bahrain GP. 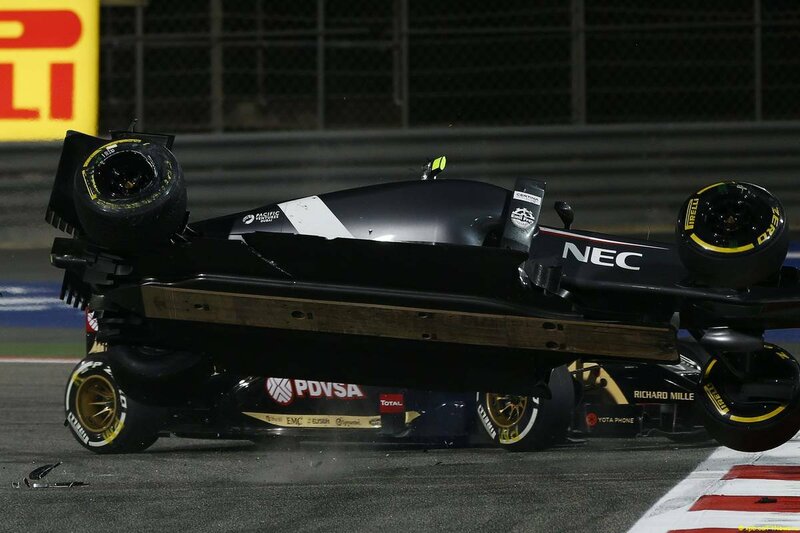 Maldonado: “I had the racing line!”. It also brings out some fantastic racing in the final part of the race. It beckons the thought that NASCAR is on to something when they have mandatory cautions in the races. (at least they did last time I watched) It gathers up the field and brings out the red mist that was reduced to strategy thinking and fuel and tire saving before that. Sadly I could not enjoy that. (I did actually enjoy the Rosberg-Hamilton battle) I could only see 2 Ferraris in 9th and 10th struggling to hold on to their positions. I watched a Force India out-traction and out-accelerate Kimi like it was nothing after turn 10. I mean, what the heck?? It not only lacks power to Mercedes cars but traction as well? 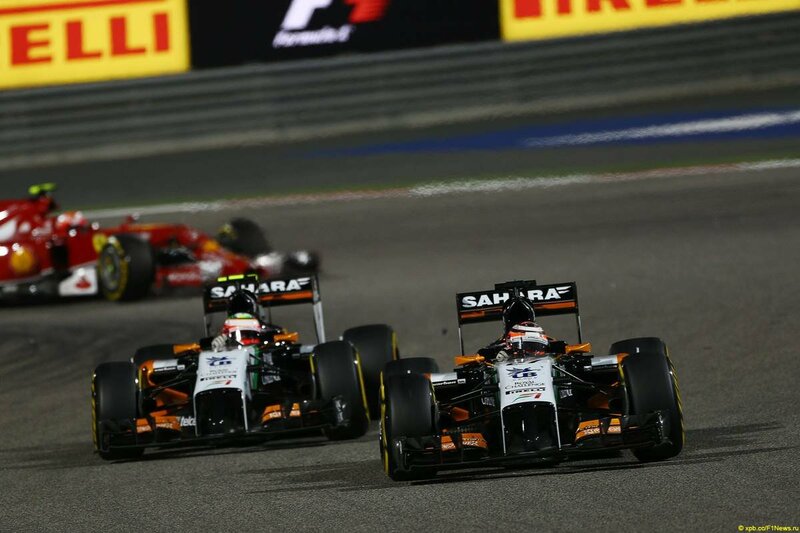 “One Force India got me on the exit of corner eight and it was like a different class,” said Raikkonen. “I was surprised. He came out of the pitlane but I had only done a few laps on the tyres. I went OK out of the corner and he just came inside of me and went past; I had no answer. Thats not exactly comforting to hear. As the cars cross the line, the World Champions occupying the first 2 places, I can only conclude that my fears and predictions from Melbourne were true. Granted, the Bahrain track didnt suit the red car but there are quite a few teams ahead of them. They were the 5th best team in Bahrain, plain and simple. On a track that suits them? Perhaps they can take up the fight with one or two of the teams ahead. But thats it at the moment. I could go on about gloomy predictions but Im gonna stop here. China is coming up but I dont think we can hope for big improvements before Barcelona. By then, the Mercedes boys are gone and.. oops. no more gloom and doom. Sorry. This entry was posted in Formula 1 and tagged Alonso, Button, Fernando Alonso, Ferrari, Formula 1, Hamilton, Ice cream incident, Iceman, Kimi, Kimi 2013, Kimi Ferrari, Kimi Ferrari 2014, kimi raikkonen, Lewis, Lewis Hamilton, McLaren, Nico Rosberg, Rosberg, Schumacher, Sebastian Vettel, Vettel. Bookmark the permalink. 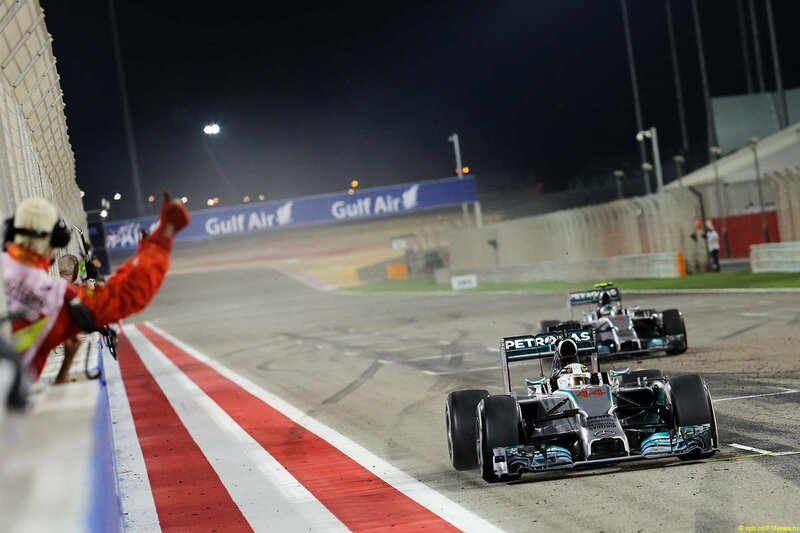 8 Responses to BAHRAIN GP 2014 – WOE UNTO YOU, FERRARI! Looks like it will be a long wait before we see Kimi on Podium this season. Ferrari is not showing any signs of immediate improvement. BTW nothing about the radio exchange between Kimi and Antonio Spagnolo 😛 ? You think Ferrari actually asked Kimi not to push? Alonso is showing signs of leaving Ferrari, if that’s the case why is Ferrari still favoring him over Kimi? Dear Soren, my personal opinion is that we could clearly see that Alonso is number 1 driver at SF. On the other hand we could see, clearly also, that Kimi is faster than FA and can get more from Ferrari than FA. NASCAR has mandatory caution after a few dozens of laps only when it has rained between the qualifying session and the race. There are no mandatory yellow flags aside from that. But I have never seen a single NASCAR race all-green anyway! One question : is it me or the new noses actually are worse in term of safety, and the driver behind is shoveling the car ahead : Kobayashi – Massa, Crashtor – Esteban G. ? A good thing is that blushing goes well with red overalls in a team where all the excuses make the prancing hoarse. Folks, Maybe FA wanted Briatore to replace Domenicali. I use to be a big Alonso fan. Then there was the Piquet Jr. disaster. I believe that Alonso should have been banned from F1 along with Briatore & Piquet Jr. Jr. was just a hapless victim of the other 2, & it cost him the rest of his F1 career. That isn’t fair or right. 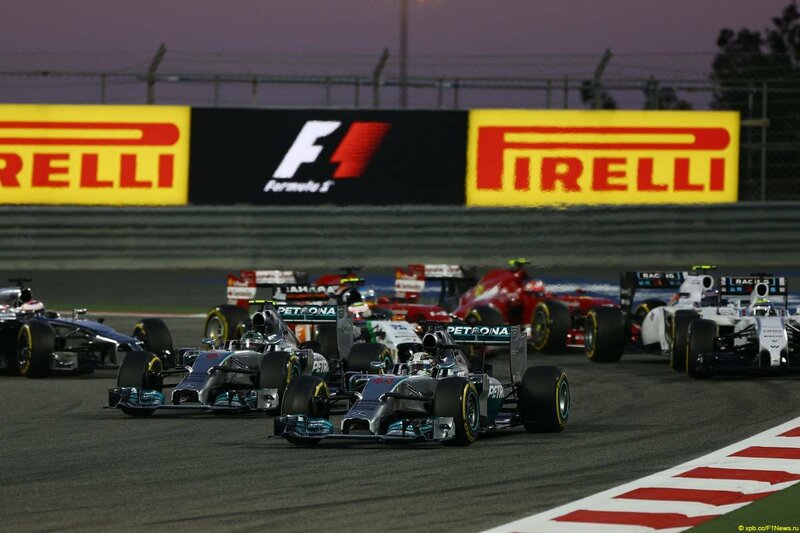 In Bahrain, both Kimi & FA ran together & finished 9 & 10. Kimi was looking forward to his 2 days of testing in Bahrain. Then I read that FA is in Kimi’s car for both days, until it would not run anymore. Then we get to China & the car won’t run in the 1st practice. Why? What was FA doing testing for 2 days in Kimi’s car. What possible use could all of that be? Have you ever heard of another team doing anything like it, or Ferrari ever doing it before? Kimi had felt good about how well he had run in Bahrain & all of a sudden in China, nothing worked right. I am asking why? Hello Soren, hope you are enjoying the spring sunshine. Your article on China is eagerly awaited. Don’t forget that for Kimi fans it is not always about winning, its about Kimi being Kimi through good times and difficult times. I’m really impressed with the honest approach that he never changes. He admits that its probably his driving style plus track and temp. There has never been an F1 driver who is that brave and honest. What I would like your views about, is why Ferrari, with so much at stake for them, have a group of techs on Kimi’s side of the garage who are seemingly not of the same standard as those working for Alonso. Is it that they were Massa’s before, and Ferrari were not concerned about how Massa was serviced? And again I worry about that nice Spagnolo guy. Surely Kimi and the late Mr Robinson discussed this in detail before Kimi signed? What’s the way forward, Soren?